Amaury Viduvier is in residence at Singer Polignac Foundation since 2014. He is also 2nd Prize of Debussy Competition 1st Prize of International music chamber competition of Lyon and "Révélation Classique ADAMI" in 2015. 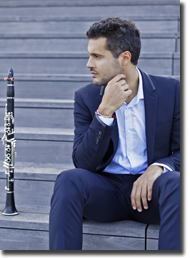 Amaury Viduvier was born in an artists family and starts clarinet at 8. Since his youngest age, Amaury is supported by his father, who is also clarinetist.Soon, success seems to smile on him. He wins his first competition at 12 and many others prizes in these years (Bellan, UFAM...). In 2008, he's awarded the first grand prize at the European Music Competition in Picardy. His brillants studies at CRR de Paris with Richard Vieille and Franck Amet are crowned by a "Premier Prix de Perfectionnement". Then in 2010, Amaury enters Paris Conservatoire (CNSM) while he is only 19, in Pascal Moragues and Jean-François Verdier's class. Again, in 2012, Amaury's excellence is rewarded when he wins the "Yamaha Young Foundation of Europe" competition. Amaury is invited to perform in several festivals such as festival de Pâques and Août musical in Deauville, Théâtre des Champs-Elysées, CASS of London, Pont-croix festival, Pablo Casals festival, Septembre musical de L’Ornes, Debussy festival, Escapades musicales du bassin d’arcachon, Jeunes Talents festival and festival de la Vézère, where he shares the stage with renowned musicians like Antoine Tamestit, Amaury Coeytaux, François Salque, Lise Berthaud, Guillaume Vincent, Adrien La Marca, Jérôme Ducros, Quatuor Hermès, Quatuor Modigliani, Quatuor Girard, Jonas Vitaud, Pierre Fouchenneret, Ismaël Margain, Adrien Boisseau... He is also often invited by France Musique broadcasts. Amaury goes one step further in 2014 in winning 2nd prize of the great Debussy International Competition held in Paris. He recently won the 1st Prize at International competition of chamber music in Lyon. 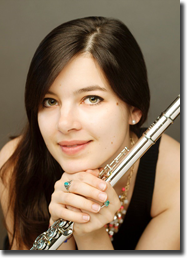 Mathilde Calderini is one of the most promising flute players of her generation. She won the First Prize of the prestigious Kobe International Flute Competition in 2013. She has already been awarded several distinctions : Special prize of the Best Young Flutist of Maxence Larrieu International Flute Competition, First Prize of the Buffet Crampon Competition, “Adami Revelation of the year”, and she is supported by the bursary “Young Talent Clos Vougeot”. She is invited to perform worldwide as a soloist with prestigious orchestras including Orchestre National de France, SWR Symphony Orchestra Stuttgart, Orchestre des Pays de Savoie, Bursa State Symphony Orchestra, Tokyo Ensemble, Hyogo Performing Arts orchestra of Osaka, Bucheon Philharmonic Orchestra, Sécession Orchestra, ... She has given concerts in major places such Théâtre des Champs-Elysée in Paris,Auditorium de Radio France in Paris,Royal Festival Hall in London, Concertgebouw in Amsterdam, Kioi Hall in Tokyo, Liederhalle in Stuttgart, Hyogo Performing Arts Center in Osaka. In addition to her work as a soloist, Mathilde dedicates a substantial part of her time to chamber music. She founded, with clarinet player Amaury Viduvier, the Ouranos Ensemble which is based on a woodwind quintet. They recently won the First Prize and Audience Prize of the Lyon International Chamber Music Competition. She has also played with great artists such as Renaud Capuçon, Nicolas Angelich, Paul Meyer, Edgar Moreau, Aurèle Marthan, Guillaume Bellom, Jérôme Pernoo, Denis Pascal, Marie Chilemme. A French native, Mathilde CALDERINI studied with Claude LEFEBVRE at CRR de Paris. She completed her Bachelor and Master degree with Sophie CHERRIER and Vincent LUCAS at the Conservatoire Supérieur de Musique de Paris. She obtained the highest distinction for her Final Recital. She also trained at the Royal Academy of Music in London with William BENNETT and Samuel COLES. Born in 1994 of musicians parents, Nicolas Ramez began studying the piano at five. Two years later, he entered the Conservatoire à Rayonnement Régional de Nantes in François Mérand’s horn class, while continuing the practice of the piano. At the age of sixteen, he entered the Conservatoire National Supérieur de Musique de Paris, in André Cazalet’s horn class where he earned a Licence degree with Mention Très Bien à l’Unanimité du Jury. 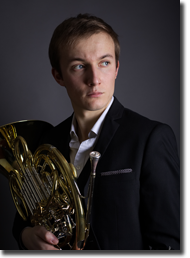 Recently awarded 3rd price at the ARD Music Competition, Nicolas started very early to distinguish himself in horn competitions. He wins at 11 the 1st price of the Wassermassons National Competition « cor petites mains », and in 2011 the 2nd price at the Brno International Competition. He was also a semi-finalist in 2013 at the Prague International Competition. After this competitions, Nicolas has been invited to play as a soloist in several concerts, including the Horn Festival of Avignon, and at the Théâtre des Champs- Elysées. He played as a soloist with orchestras like l’Orchestre de Chambre de Paris, l’Ensemble instrumental de l’Ouest, l’Harmonie de l’Armée de Terre or l’Orchestre Lamoureux. In January 2016, he joined the Orchestre de Chambre de Paris as first horn solo. He continues to invest himself in various projects especially with the « Ensemble Ouranos », wind quintet supported by Singer-Polignac foundation, with wich he takes part in many musical manifestations in the whole France and Europe. The Ensemble Ouranos recently recorded their first album. 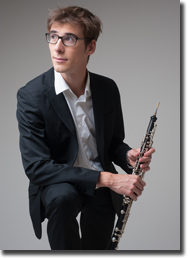 Born in 1990, Philibert Perrine studied the oboe with Jean-Claude JABOULAY and Michel BENET in CNR of Paris, then he completed his bachelor and master degree with Jacques TYS, David WALTER and Frédéric TARDY at the Conservatoire National Supérieur de Musique de Paris. During his studies, he played with several young orchestras as Gustav Mahler Young Orchestra, or Schleswig-Holstein Music Festival Orchestra. Passionate by chamber music, he's member of the Ouranos Ensemble, wind quintet that won first prize, audience prize and Bullukian prize in International Chamber Music Competition of Lyon. He also played with great artists such as Renaud Capuçon, Nicolas Angelich, Laurent Lefèvre, Guillaume Bellom, Gustavo Nunez, Carlo Colombo. Finalist of Prague Spring International Competition in 2014, he is the winner of the Crusell International Oboe Competition the same year. He is rewarded with several others distinctions : « Adami Revelation of the year 2016 », third prize and special prize for the commissioned piece of Japan Sony Foundation International Music Competition in 2015, third prize and special prize for the commissioned piece of the Muri Competition in 2016. Those rewards led him to play soloist with several orchestras such as the Prague Chamber Orchestra, the Gunma Symphony Orchestra, the Jousia Ensemble, the Argovia philarmonic. Since 2015, he is co-principal oboist in Paris Opera. In 2016, he's “Adami Revelation of the year”. 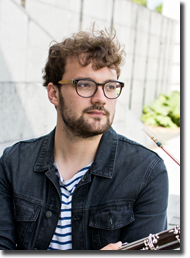 Rafael Angster was born in 1992 in Strasbourg, France, where he began to study french bassoon with Jean-Christophe Dassonville at the age of 8. He then studied with maestros Gilbert Audin and Philippe Hanon in the Conservatoire National Supérieur de Paris (CNSMDP) where he graduated in may 2015 with the highest marks and congratulations of the Jury. He also attended Masterclasses with Laurent Lefèvre and Daniele Damiano. During his studies, Rafael had the occasion to explore several domains he’s passionate about, such as chamber music and improvisation. He then co-founded two chamber music ensembles, l’Ensemble Ouranos and Les Francs Bassons, both prize-winners in international competitions, with which he makes numerous concerts all around the world. He also won in 2012 the 2nd Prize and the Prize forbest rendition of the modern piece at the K.M. v. Weber International Bassoon Competition in Wroclaw, Poland. Rafael currently holds the position of principal bassoon in the Orchestre Philharmonique de Strasbourg (France).